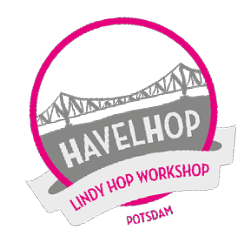 We will have four levels of Lindy Hop during the HavelHop. Please read the level description carefully and evaluate yourself honestly. Homogenous classes are best for everyone! There will be no level changing on the spot. We will split level B and C each into two groups. This will happen on Friday morning. All six groups will have ten hours of teaching throughout the weekend, each teacher couple twice. You have learned the basics and you are comfortable with Swing Out, Circle, Back Charleston and a few more patterns. You have been dancing for at least 5 month. This is the first international Workshop you're participating in. You have been dancing regularly for one and a half year or more and you are able to lead or follow a lot of different steps. You can lead/follow a change from 6 count to 8 count. You know that a good connection is very important and you want to learn some more new moves but also want to improve your techniques. As a leader: You hear breaks coming up in the music and can adapt your lead to it. You’ve been dancing regularly for more than three years and you are confident and solid in the dance and ready for more. You can lead/follow a swing out in different moods according to the music. You can do individual styling without interfering with your partners lead/follow. You have a good connection to your partner and you are looking for up tempo swing and new improvisations. As a Follower: You can follow steps, even if you didn't think that they were coming. This is the second or third international Workshop you're participating in. You have been actively dancing for at least five years or more, you attended several international workshops and you are able to learn almost any step. Dancing fast is becoming more easy as you relax more. You now understand that to become an advanced dancer you need to go back to the basics. Here it’s not about patterns and figures, but about steps to mix creatively. You will learn more technique in a very challenging way. You know that there is nothing more distracting and more difficult than not thinking while dancing.